The stage was now set for one who would dominate the movement for more than two decades, a genteel and tiny tigress, Lady Elizabeth Anne Mould Blount. Lady Blount was born in south London at about 5:00 p.m. on Tuesday, May 7, 1850. Her father, architect and land surveyor James Zecharias Williams, hailed from Cader Idris, a mountain in northern Wales. Williams had an interest in astronomy and friends in high places—Prince Louis Napoleon, for instance, later Emperor of France. He was a middle-aged widower with seven children when he married Elizabeth Anne Mould, daughter of a scholar and solicitor. Elizabeth Williams was pious and musically inclined. When the time came to deliver their first child, a girlhood injury impeded her. After a long, difficult, and fruitless labor, surgeons delivered the child by Caesarian section. Forty-four years later, the surgeons were criticized in an astrological magazine. According to the July 1894 issue of The Future , they picked the worst possible time, astrologically speaking, “for they began it just as the evil planet MARS had culminated!” Had they waited until Jupiter culminated three hours later, the stars would have been more favorable. Stars or no stars, the now-routine operation was exceedingly dangerous when performed without anesthetics, antiseptics, or antibiotics. The young mother died five days later. Her twice-widowed husband gave the baby her name, Elizabeth Anne Mould Williams. Mercury being strong in Gemini and so near Venus, and configurated with the ascending degree (by the aspect of 135°) childhood was characterized by cleverness, studiousness, light-heartedness, and love of music. Lady Blount inherited from her mother exceptional musical talent. Jupiter being in a prominent position, in zodiacal parallel with the ascendant and connected with the Moon (in a Jovian sign) by zodiacal parallel, the religious feeling of the mother was also inherited by the child, free from narrow-minded sectarianism. With all due respect for Jupiter, James Williams, like his second wife, was a devout Christian, and he might have influenced the religious convictions of his youngest daughter. In 1862, when Elizabeth was only 12, James retired to Hereford, a town of 10,000 lying in a wooded river valley near the Welsh border, 144 railway miles west-northwest of London and about 45 miles north of Cardiff as the rook flies. There he educated Elizabeth far beyond the norm for 19th century English women. As she matured, her beauty, intelligence, and wealthy father gave her above average prospects. In October 1870 [ref. 7.1] , at age 20, she married Walter de Sodington Blount. Walter was a Roman Catholic and seventeen years older than his Protestant bride, but he was eldest son of Baronet Edward Blount, and presumably his prospect of a title and 6000 acres more than compensated for these deficiencies. There are indications that the marriage was not a happy one. Sir Walter inherited the title and land in 1881, but he was (in the eyes of his wife) cold, cruel, and Catholic. If he had any unusual opinions, he didn’t express them in the public press. Not so his lady. Lady Blount was a right-wing Shirley MacLaine, and she went out on many a limb. She promoted causes, pursued publicity, and was not reluctant to express an opinion. Like Charles Johnson, whom we will meet in Chapter 9, she was an ardent antivivisectionist. Among her medical unorthodoxies was her booklet entitled Magnetism as a Curative Agency . She was closely associated with the Anglo-Israelites, who still claim the Anglo-Saxons are the true heirs of Abraham, and the British monarchy reigns from the Throne of David. Lady Blount (from her novel Adrian Galilio ). 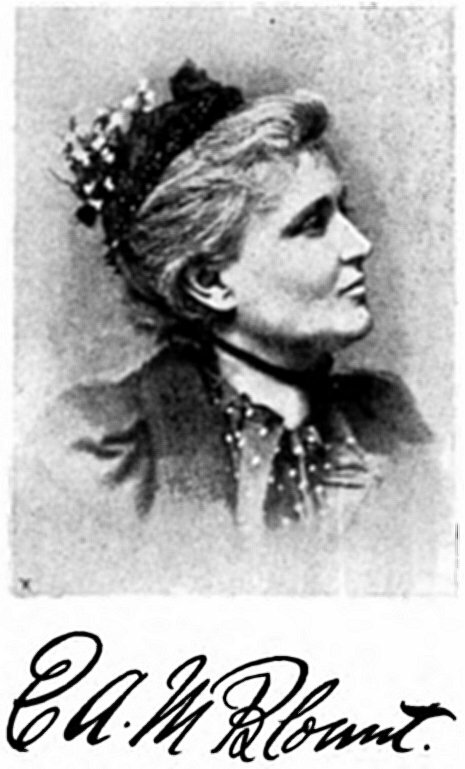 Lady Blount first appears in flat-earth annals in 1892, when The Faith , a British Seventh-day Adventist periodical, published some of her planely worded letters-to-the-editor. Around the same time, she published a broadsheet blasting the spherical heresy. She was then 42 years old, the mother of four teenage children and, by her own admission, a geographer, explorer, mathematician, author, and poet. Cyrus E. Brooks, editor of The Faith , represented the majority view in adventism. Brooks rejected zetetic astronomy and (after publishing a few letters, including one from Lady Blount) refused to print zetetic letters. His periodical remained a favorite of “Zetetes” and other zetetics, however, and he retained the respect and friendship of many of them. In 1898, for instance, Brooks published Lady Blount’s flat-earth novel Adrian Galilio: A Songwriter’s Story . The same issue contains an organizational manual for the UZS, the first published. It shows the Committee included Lady Blount of Bath. The July 1894 issue contains a sort of flat-earth catechism which she produced. At first she played second fiddle, but she gradually took over the orchestra. Lady Blount felt called upon to raise the cultural level of the zetetic society. Modern sophisticates think it unseemly to commit hopes, fears, aspirations, or fetishes to rhymed verse. Victorians were less inhibited. “The Nebular Hypothesis,” characteristic of Lady Blount’s poetical works, scoffs at the idea that the solar system (including planet earth) condensed out of a cloud of hot gases. When a power, perhaps “Nether,”? How it happened no mortal can trace! Could there be a “Nether”? Or an upward or downward at all? And shooting through space like a ball. What before was good gravity doing? Once a cinder shot out from the sun! The sparks, how they flew! And a beauty so bright made the Moon! And play all around while pursuing! Shall men set forth in righteous robe! The pair collaborated on a number of musical compositions. A later issue of Earth Review advertised sheet music for the “Earth Not a Globe Valse” and “about 30 other Waltzes, Songs, Hymns, etc., by the same authors, from 1/- to 4/- each. Military Band Parts, when published, from 6/- each set.” One of the numbers offered was “ Je T’Aime ” (“I Love Thee”). Like his friend and collaborator, William Thomas Wiseman was a wellspring of unorthodox ideas. In 1882, under the pseudonym “Abdiel,” he had published Vaccination and Smallpox , a pamphlet opposing vaccination. He was also author of two religious tracts and a pamphlet entitled The Metropolitan Water Supply . An ardent Anglo-Israelite, Wiseman later founded and edited the The British Ecclesia , journal of the Anglo-Israelite group with the latter name. I now, after many years, endorse the old sailor’s experience, that the world is not a globe, and I have never found the man who could prove by any practical demonstration that he, or I, are living on a whirling ball of Earth and water! How is it that the atmosphere goes round with it? By what law does the dense Earth and the rare air rush round together? Declare, ye scientists, IF YOU KNOW! The Scriptures of God’s inspired Prophets contradicts [ sic ] the unreasonable, illogical, unscientific delusion, and false philosophy, that the fixed Earth is a hollow fireball with several motions! After a flurry of zetetic activity in 1895, Wiseman seems to have faded from the zetetic scene. Others came on to stay. Though the British zetetic movement was certainly down, Lady Blount made sure that it wasn’t out. She soon founded another journal, Earth , which she edited from at least January 1900 to November 1904. And she continued her lectures, debates, and letter writing. Apparently, someone went back to the Old Bedford Canal in 1900–1901 and performed new experiments. These aroused sufficient interest among conventional scientists that on September 17, 1901 one H. Yule Oldham read a paper about the various Bedford Canal experiments before the British Association for the Advancement of Science. Oldham assured conventionalists that everything was all right. His paper is mentioned in the B.A.A.S. Proceedings , but it was not deemed worth printing. The paper is cited in English Mechanic 80:256. Lady Blount was author of a little tract called “The Lord’s Day,” which advocated the Seventh Day sabbath. It was distributed by the same Stanberry, Missouri, Adventist group from which Herbert W. Armstrong later emerged. Clifton was strongly impressed by the results. “I should not like to abandon the globular theory offhand,” he wrote, “but, as far as this particular test is concerned, I am prepared to maintain that (unless rays of light will travel in a curved path) these six miles of water present a level surface.” In fact, Clifton’s description of atmospheric conditions that morning—“an aqueous shimmering vapour [floated] unevenly on the surface of the canal and adjoining fields”—suggests mirage, which is the bending of light rays by temperature variations in the atmosphere. But Clifton and Lady Blount didn’t think so, and when they subsequently repeated the experiment, Clifton reported that he could distinctly see two images, the sheet and its reflection on the water. Lady Blount tried to place these results before the public, but with indifferent success. A few newspapers published her letters. That autumn, the weekly English Mechanic and World of Science published an exchange of letters between her and their bemused readers. This culminated on October 28, 1904, with publication of the famous photograph (in which I can’t even find the bridge). But there was no wholesale abandonment of the globe and, except among zetetics, the experiment was quickly forgotten. Also listed were the twenty-four members of the UZS Committee, a nice mixture of old and new names. The new committee included British stalwarts Alexander McInnes of Glasgow University; A. E. Skellam, for two decades an avid flat-earth lecturer; the brothers John and Isaac Smith of Halifax; and Albert Smith, here sans his zetetic pseudonym. Reverend E. W. Brookman of Toronto, the Adventist Elder Miles Smith of New York, and Dr. Thomas E. Reed of Middleton, Ohio lent an international flavor. Major-General Edward Armstrong and Dr. E. Haughton, Senior Moderator in Natural Science at Trinity College, Dublin, added a touch of authority. The British clergy were represented by the Reverends A. T. de Learsy, E. V. Mulgrave, E. W. Bullinger, and Archbishop C. I. Stevens. Some of these are old friends. Others we will meet in the next chapter. Several should, however, be noticed here. Charles Watkyns de Lacy Evans, “M.R.C.S., Ph.D., etc., late Surgeon, Gold Coast” did not call himself M.D., but he obviously had an interest in medicine. Evans had been vice president of the original Zetetic Society when it formed in December 1883. Later, he wrote a book on the cause of death, increased longevity, phosphorus, and so forth that appears suspiciously familiar from the title. Obviously, he was a disciple of Rowbotham. He also wrote Consumption: A Reinvestigation of its Cause and Cholera: Its Causes and Prevention , the latter being a reprint of a lecture. The British flat-earthers had always hoped to convert the Church of England to the plane truth, but their successes were limited. Bagging a real, live Archbishop for the UZS Committee was perhaps Lady Blount’s greatest coup. In the eighty-odd intervening years, however, Archbishop Stevens has been largely forgotten. The same cannot be said for his contemporary, Ethelbert William Bullinger. Ethelbert William Bullinger, English divine and writer on New Testament criticism and Biblical theology, was born 15 December 1837. One of his ancestors, Swiss reformer Heinrich Bullinger of Zurich (1504–1575), was a follower of Zwingli, a collaborator with Calvin, and a sometime theological opponent of Luther. Just as Heinrich Bullinger’s views strongly influenced the Reformation in England, so Ethelbert’s views would influence American fundamentalists. His Number in Scripture and The Witness of the Stars are both in print and are highly regarded by many fundamentalists, including Henry M. Morris, founder and president of the Institute for Creation Research. The first tackles the numerological significance of virtually every number used in the Bible (seven, for example, is the number of spiritual perfection); the second proposes the theory that at Creation God encoded into the constellations a prophecy of the coming of Christ—thus, Virgo is the Virgin Mary, for example. Though he died in 1913, Bullinger remains influential among fundamentalists who accept dispensationalism. This is the belief that God’s master-plan for the World, from Creation to the End, set out as a sequence of stages or dispensations, can be gleaned from a literal interpretation of the Bible, from Genesis to Revelation. One of his books was The Foundations of Dispensational Truth (published posthumously, 1930), consisting of material reprinted from Things to Come . Of his seventy-seven published works, seven (including Number in Scripture and The Witness of the Stars ) are still in print. Lady Blount continued her lectures, and in 1914 she published Our Enclosed World , a book of extracts from them. Her husband, Sir Walter de Sodington Blount, died in October 1915.
a) The flat-earth movement never had big money behind it. Creationism is promoted by multimillion dollar television ministries. b) Mainstream British Christianity had no strong tradition of absolute literalism. The Bible is far more explicit about the Noachian Deluge than about the shape of the earth, but the Church of England had already made peace with uniformitarian geology (which finds no evidence of a universal flood) by the time the flat-earth movement got started. Indeed, the absolute literalists such as the Seventh-day Adventists were large contributors to the movement. Until this kind of absolutism developed among American fundamentalists, creationism got nowhere. Again, it was the absolute literalists—the Seventh-day Adventists—who led the way in creationism. c) It is much easier for would-be literalists to rationalize away the flat-earth verses of the Bible than it is to do the same with the creation story. English-speaking fundamentalists were aided in this by the King James translators, who themselves rationalized away some of the more explicitly flat-earth passages in the Bible. d) The flat-earth movement never converted many Falwells. The only prominent churchman they converted was Ethelbert William Bullinger, and he was not nearly as influential in his lifetime as later. Furthermore, he was mainly a closet flat-earther, and he never beat the drums for the Plane Truth like Jerry Falwell has for creationism. f) The sphere does not threaten fragile Christian egos like the image of the chimpanzee. (Fundamentalists want desperately to “be as gods,” and they can’t deal with the idea that they might be something less.) Preachers can easily argue that all of Christianity collapses if evolution is true. g) The flat-earthers actually had a model to defend, and not a very good one. The creationists typically refuse to talk about creationism in public, concentrating almost exclusively on attacking evolution. The creationist tactic is intellectually dishonest but successful. h) Preachers in British churches were not constantly attacking the sphericity of the earth. Fundamentalists have been preaching hatred for evolution (and, by extension, most of science) ever since Darwin. Many fundamentalists have been listening to anti-evolution sermons off and on all of their lives. Thus, when someone with scientific credentials comes along and says the same thing, they have been programmed to believe it. i) Psychologically, fundamentalists “bet the farm” on doctrines tied to a certain interpretation of the Bible. First of all, there is autocorrelation; they wouldn’t be fundamentalists if they didn’t have a powerful opinion of their position in the universe—the image of God and all that. They have sold their souls for a doctrine much threatened by evolution. In 1923, Lady Blount married Stephen Morgan, and she apparently had little to do with the Blounts or the flat-earth movement after that. Her grandson, Sir Walter Edward Alpin Blount (1917–2004), remembered her as a tiny old lady who always wore black and didn’t say much—unless someone set her off with a word like “globe.” Lady Blount died in December 1935. By then, the British flat-earth movement was in limbo, but zetetic seeds were firmly rooted across the sea.